I have discovered, during the course of breastfeeding my babies, that they don't appreciate my love of cow's milk. I LOVE, LOVE, LOVE milk - the thick, creamy, 4% milk fat (i.e., whole) milk. I love it in my cereal, I love it with meals, I love it with cookies. I love it in a 12 ounce glass, 34 degrees Fahrenheit, on a hot day or a freezing day. I love the stuff - you get my point! I usually notice by my baby's second week of life that dairy is going to be an issue for a while. The baby starts passing a lot of gas, then starts crying, screaming, straining while passing that gas. Some people would call it colic. I recognize it as a milk intolerance - from what I understand, a baby's intestines aren't mature enough to process certain proteins found in dairy products until the baby is about 4 months old. With my oldest child, I gave up milk for 4 months. I tried lactose-free milk (not realizing at the time that this intolerance had nothing to do with lactose). Lactose-free milk was a horrible substitute - not only did it not solve the problem, but milk with the milk sugars removed and other sugars added is not tasty to a whole-milk addict such as myself. With my oldest son, I had to give up milk again. Again, for 4 months. I tried goat's milk. I kept having visions of that scene in "Monsters, Inc." where the Abominable Snowman tells Sully and Mike that he has fresh yak's milk - and it's not too bad after you pick the hairs out. Needless to say, I couldn't drink the stuff. When Tricky was breastfeeding, I didn't try any substitutes. I gave up milk for 3 1/2 months and slowly reintroduced it into my diet. I've again given up milk for Chaucer. However, I had to find a substitute. I tried soy milk, but his fitful gassiness didn't disappear. [I read that, while some mothers can substitute soy, there are babies with an intolerance to the soy proteins.] A friend suggested I try almond milk. THAT'S IT!!! The original is fabulous! 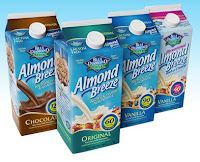 A slight almond taste (very slight), no aftertaste, thick (albeit, not quite as thick as whole milk), fewer calories, great in cereal or with a meal. The vanilla flavor is tasty, too, but only with certain things... I drink it with cookies or put it in my oatmeal. Yes, almond milk... a viable substitute for a milkaholic. The only problem... Starbucks doesn't have it. I have discovered that a white chocolate mocha with soy isn't too bad! EDITED TO ADD: Fortunately, none of my children have milk/dairy allergies. For my kids, this milk intolerance seems to last only for the first 3-4 months of life, just long enough for their intestines to mature enough to properly digest the milk enzymes. I gave up dairy in all forms for 11nonths to breastfeed my Emma. I was literally insance for cheese before it was done !! She now drinks Silk. Almond Breeze and Rice Milk. Non of it is good for cooking though LOL. We had her tested and she is allergic, not just intolerant. Congrats for lasting 4 months !!! I am glad you found something. I am not a huge milk fan, but you sound a lot like my father, he LOVES milk. It was rough for him to give up whole for his heart and sugar. So I can kinda imagine what you are going through especially knowing that there will be a time that you can drink it again. I had to cut out dairy for a year (!) with my youngest son. I went through soy and rice milk before I found Almond Milk. Mmmm it's good although I am back to whole milk myself (I'm with laywermommy, love the whole!). However, the chocolate almond milk is divine, don't try it if you don't want to buy out the store!